This is a humorous sculpture by the listed Austrian artist Hans Muller. 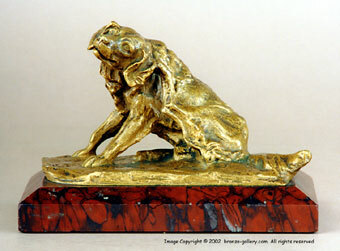 This scratching Setter dog is finished in a gilt patina and is mounted on a 6" by 4 " by 1" thick highly figured red marble base. It was cast around the turn of the century by a Vienna foundry and is signed H. Muller on the reverse side. Most of Hans Muller's bronzes including a model of this bronze are in the Simu Museum in Bucharest.